Please Note: This kit contains color numbers only, and is used as an aid in the description of color names. It is not intended to replace or standardize hues associated with common color names. Spec-Tru is ideal for describing colors of insulators, bottles, etc. in letters, E-mail, trade lists, and over the telephone. It is also a great tool for cataloging the colors in one's own collection. 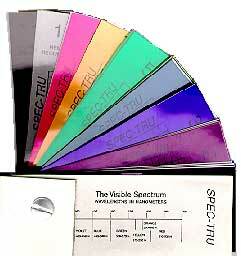 For more information about The Spec-Tru Color Reference and how to order visit the Spec-Tru web site.